SCVHistory.com | Placerita Canyon | Laurel and Hardy Star in 'Way Out West' (1937). Laurel and Hardy Star in "Way Out West"
Stan Laurel and Oliver Hardy star in the 1937 comedy, "Way Out West," partially shot in Placerita Canyon. Produced by Hal Roach and Stan Laurel for MGM, "Way Out West" also stars Sharon Lynn as Lola and features James Finlayson, Rosina Lawrence, Stanley Fields and Vivien Oakland along with the musical troupe, the Avalon Boys. Laurel and Hardy are seen traipsing through Placerita Canyon, probably primarily at what is now Rancho Maria at 25933 Sand Canyon Road. Note: When Laurel and Hardy are dancing to the music of the Avalon Boys, they're on a sound stage at Hal Roach Studios in Culver City with stock footage of a Western movie town rolling behind them. Look at the shadows. We have to believe it's a coincidence, but here in 1937, Placerita Canyon becomes Brushwood Gulch, a slippery place with much drinking, gambling and carousing. A dozen years later, Ernie Hickson, owner of the movie ranch down Placerita Canyon Road, would transform his own property into Slippery Gulch on the Fourth of July, where drinking, gambling and carousing made it a celebration to remember. Or not. Pampa (Texas) Daily News | May 16, 1937. 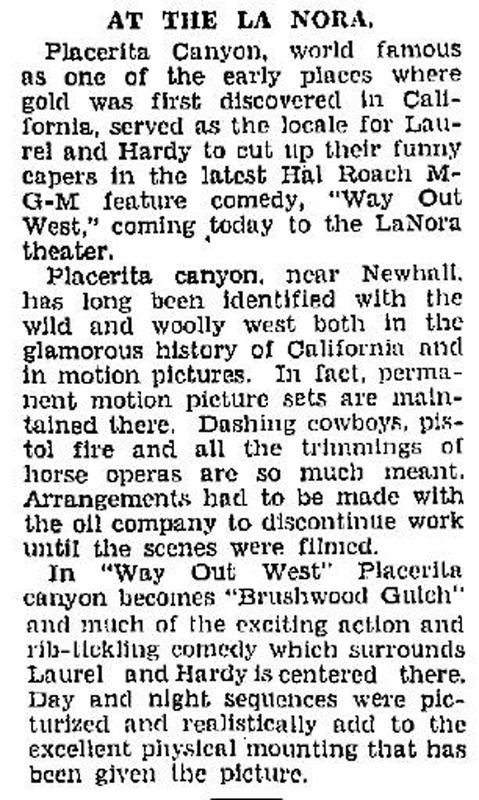 Placerita Canyon, world famous as one of the early places where gold was first discovered in California, served as the locale for Laurel and Hardy to cut up their funny capers in the latest Hal Roach M-G-M feature comedy, "Way Out West," coming today to the LaNora theater. Placerita canyon, near Newhall, has long been identified with the wild and wooly west both in the glamorous history of California and in motion pictures. In fact, permanent motion picture sets are maintained there. Dashing cowboys, pistol fire and all the trimmings of horse operas are so much meant. Arrangements had to be made with the oil company to discontinue work until the scenes were filmed. In "Way Out West" Placerita canyon becomes "Brushwood Gulch" and much of the exiting action and rib-tickling comedy which surrounds Laurel and Hardy is centered there. Day and night sequences were picturized and realistically add to the excellent physical mounting that has been given the picture.